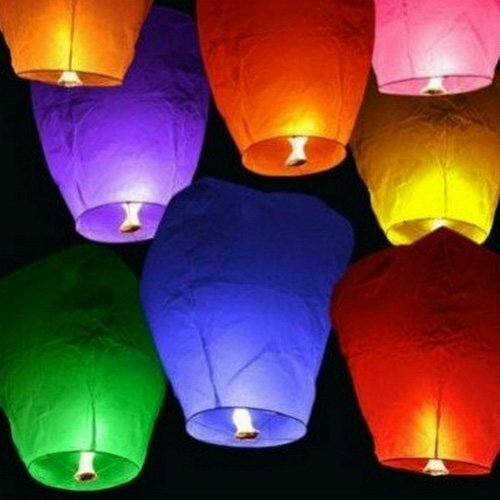 Sky lanterns give you the opportunity to create a truly unique experience for your event or celebration that will be remembered. You can be sure that everyone will want to share the same memories with their friends and family at their events! When sky lanterns are simultaneously released into the night sky they create a truly mesmerizing display, which is both noiseless and epic. They are ideally suited for a multitude of celebrations such as Weddings, Birthdays, Anniversaries, New Year parties, back-yard BBQ's, tailgating and much more. They are easy to use and come complete with simple to follow instructions. Sky lanterns are also known as Khoom Fay, Khoom Loy, Kung Ming, Sky Lanternen, Himmelslaternen, Fire Lanterns or UFO Balloons. They utilize the heat of fire to create an unforgettable moment. These fully biodegradable lanterns are made out of rice paper, non-toxic wax and bamboo. They are fitted with fuel cells for a longer flight and will burn for 5 to 10 minutes and can fly over a mile high! View More In Sky Lanterns. If you have any questions about this product by Fire Lanterns, contact us by completing and submitting the form below. If you are looking for a specif part number, please include it with your message.